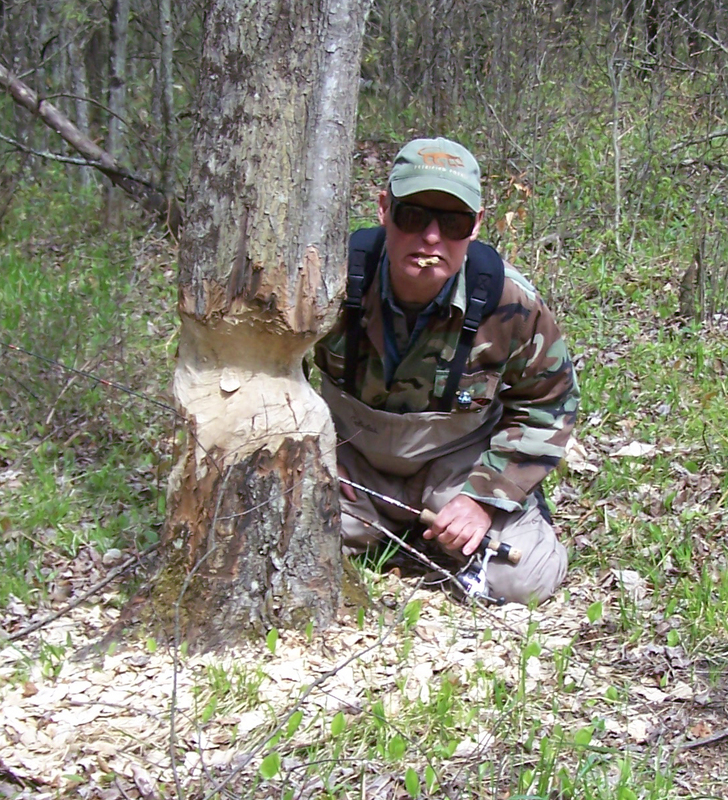 My wife has been asking me to bring home some trout for dinner so when I called up Feral to see if he wanted to go fishing last Saturday I told him up front that was the mission. 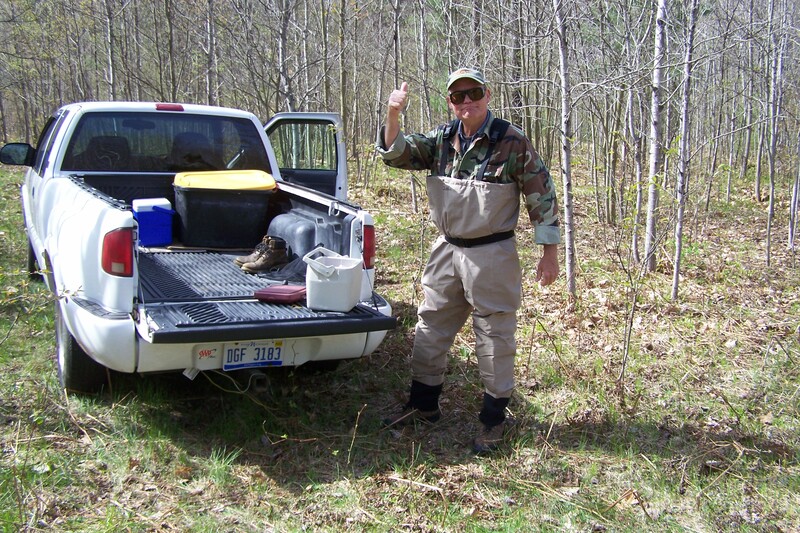 We started on a upper stretch of the Pine River in Lake County which was not as high or muddy as we had hoped. 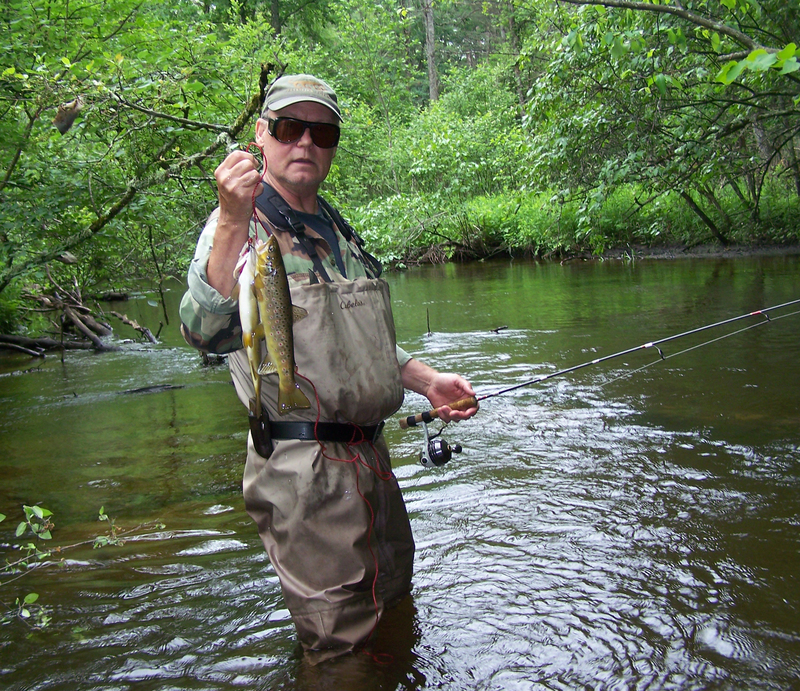 Still, Feral caught a nice brown about 14 inches and I was surprised by a Brook Trout. 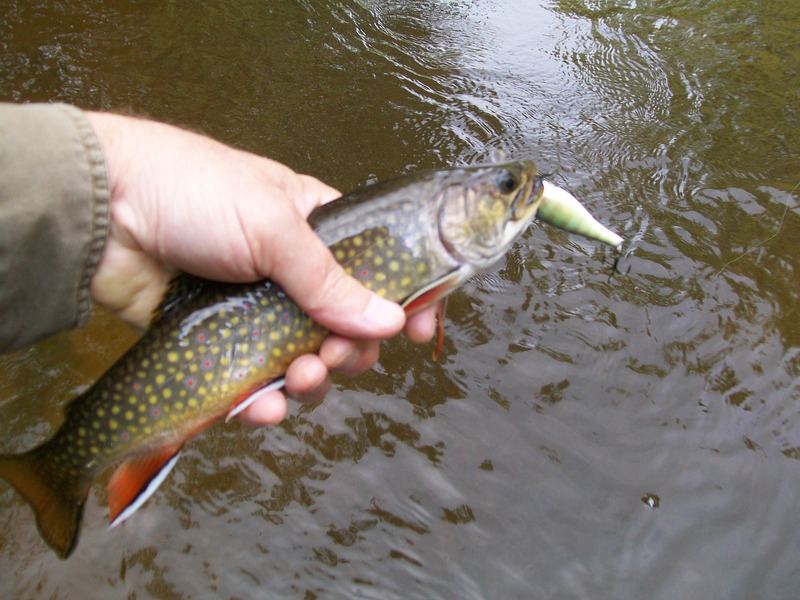 We don’t keep brook trout, even for the skillet, under the assumption that releasing them may help the population. 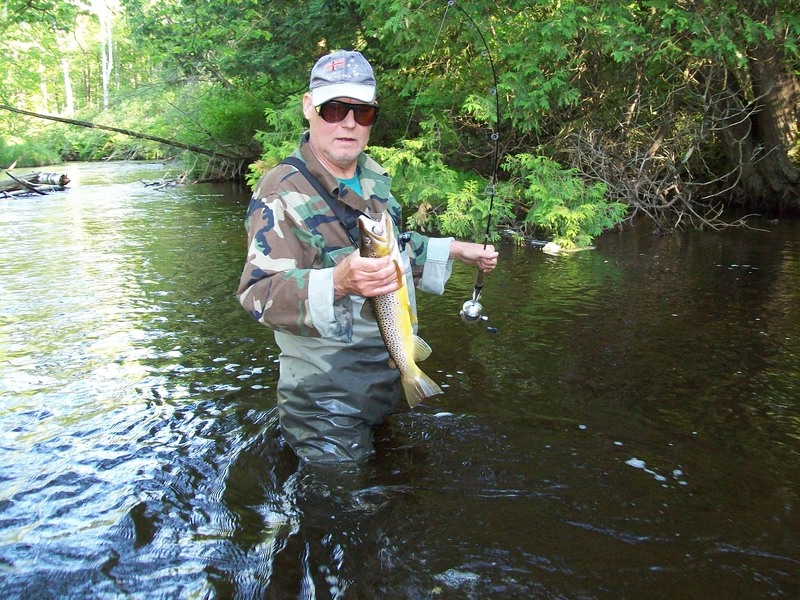 We catch one brook trout to every 20 browns so it is an event just to see one and appreciate the beautiful coloring. Feral kept the brown trout though. 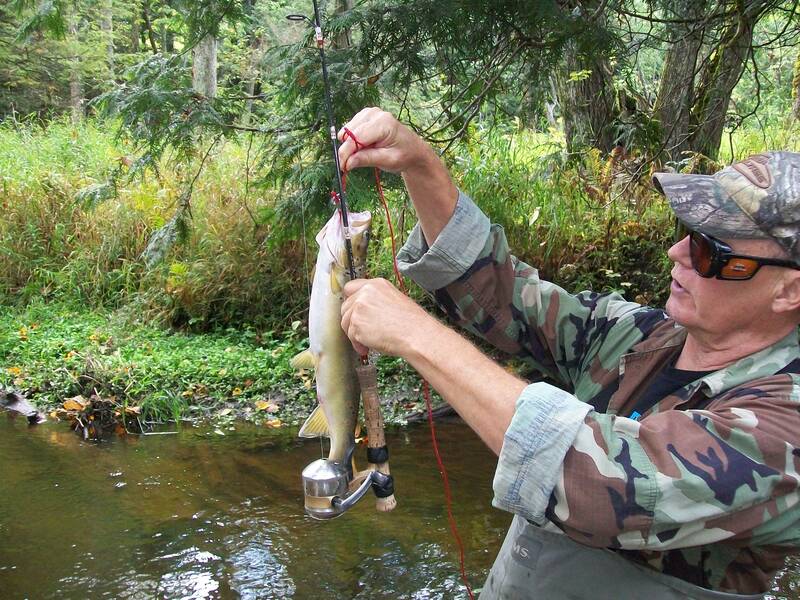 He too was thinking “trout dinner.” Feral has some markings on his fishing rod to confirm fish size which you can see on the photo below. If you click on the photo ( use browser back button to return) you can see his markings at 15, 20 and 25 inches. 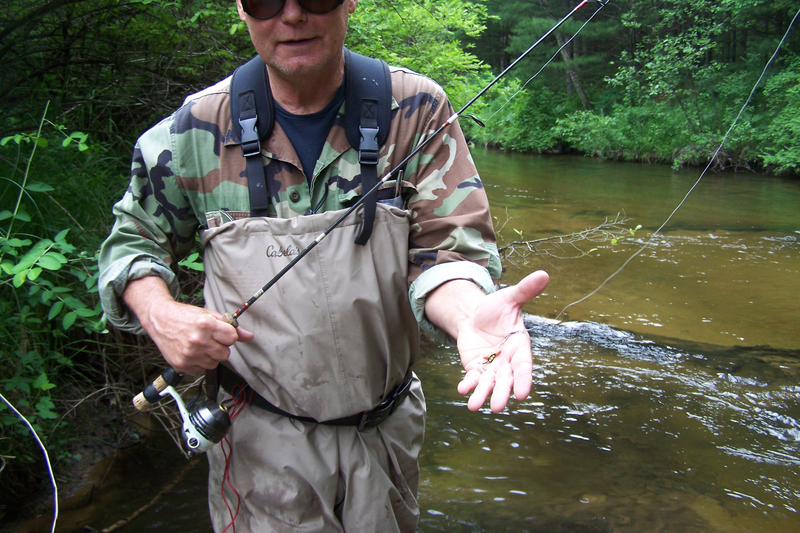 That’s not a hoax, Michigan streams give up brown trout that large, especially in the fall. 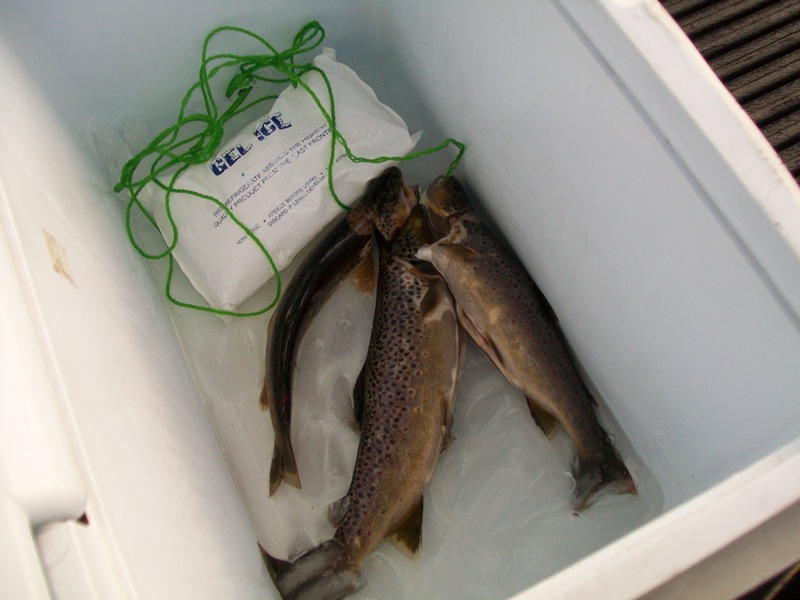 As far as we’re concerned though, smaller trout taste better, let the big ones go. 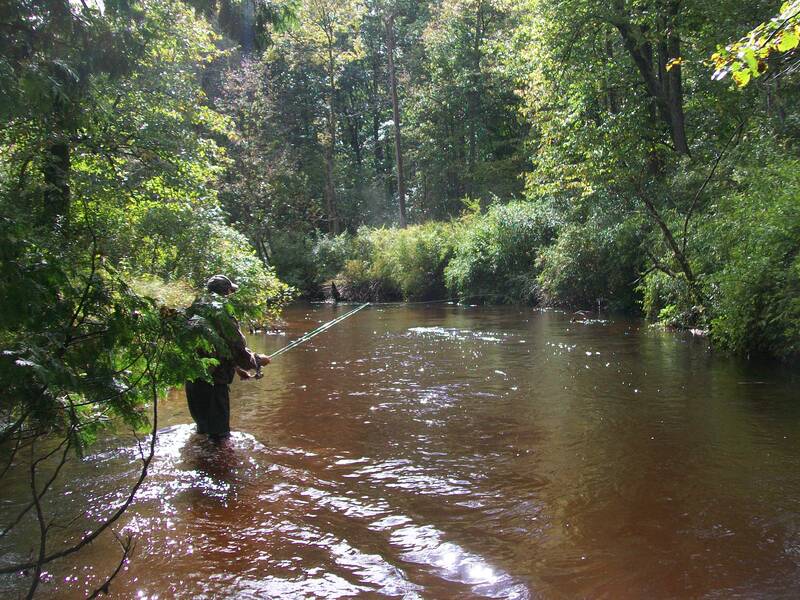 Feral mentioned the Little South Branch of the Pere Marquette River and the thought was maybe it received a bit more rain than the Pine, in which case the fishing might be excellent. So we headed south. The river was spectacular and the weather cooperated with rain and drizzle interspersed with bright sunshine, back and forth. The temp was around 70 so it was comfortable to wear rain gear. We started catching fish right away and seeing some pretty nice fish, upwards of twenty inches, but the big ones seemed to be looking only, following the lure back or making passes without a strike. 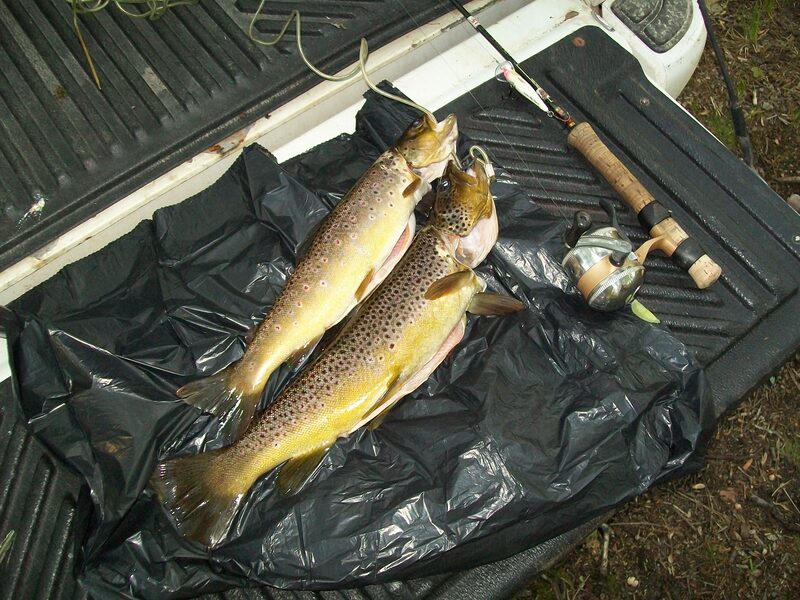 The better news was the dinner size trout, keepers around 12 to 14 inches, were hungry. Feral kept a couple and I kept three figuring that was about right for my wife and I.
I cooked the trout on Sunday, September 11, a day of reflection and sadness for America. The horror of 9/11 still makes no sense to me. I spent part of the day writing an editorial, for my own sanity, just to try to understand, and part of the day watching Saving Private Ryan. When my wife came home from work at 5:00 I dove into cooking the trout. It was good. She said I need to bring home trout more often. I didn’t do well with table talk. Managed to get away for an overnighter with Feral whereby we fished the heck out of Leverentz (for pike and bass) with lake fishing specialist Chuck Raison who was kind enough to bring a boat. We had our kayaks with us but there was a strong wind directly out of the east that would have kept us paddling instead of fishing. So Chuck was kind enough to motor us around. Unfortunately it was a cold front also. I don’t have to tell pro anglers what that means for fishing. I saw one Pike that came up for a look. I was the guy with all the luck. 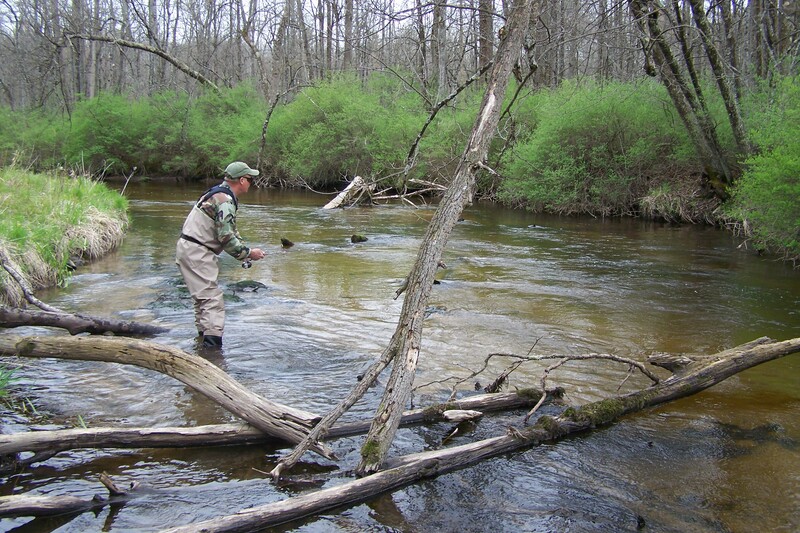 So Chuck headed out and Feral and I decided to hit the streams. First choice Pine River up by Tustin to a small upstream stretch we hoped would not be flooded. The cold front followed a whole day of steady rain so it was taking a chance to drive up there. And it was flooded. 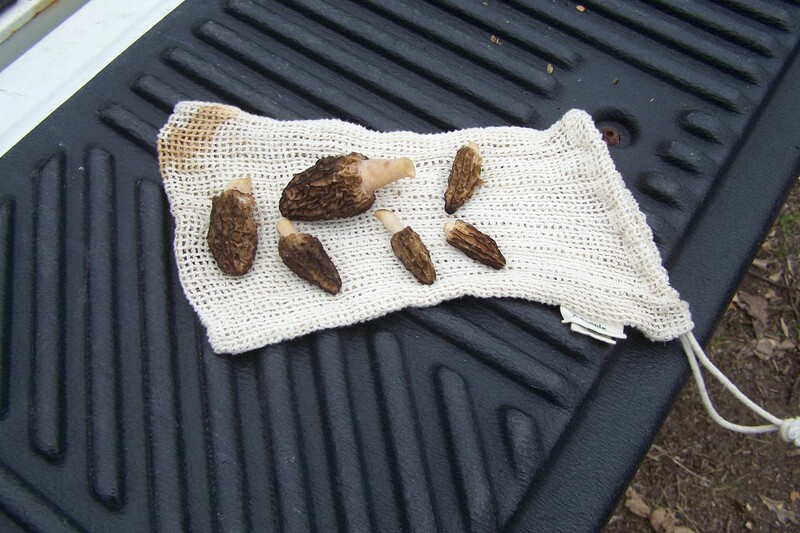 We threw some lures from the bank but didn’t stay long. 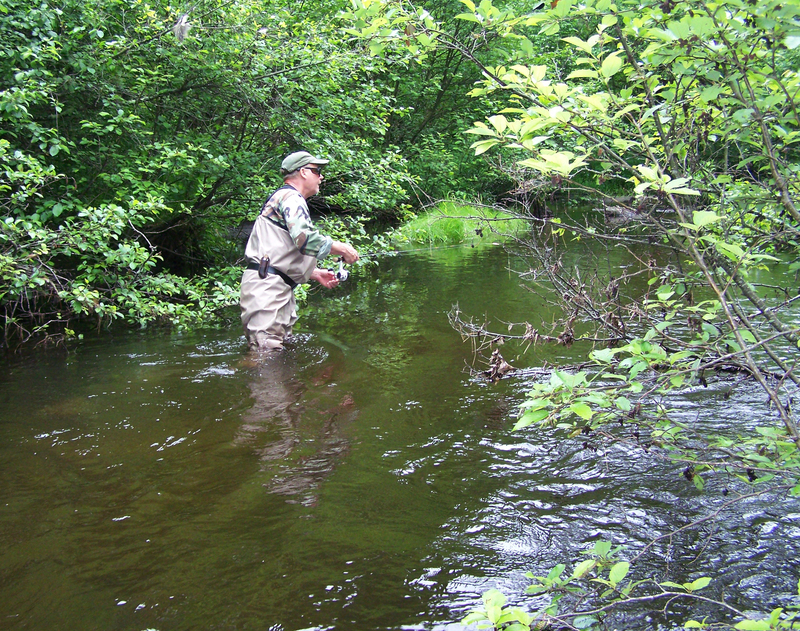 We decided to try an upstream stretch of the Little South Branch of the PM and that was wadable, but high. 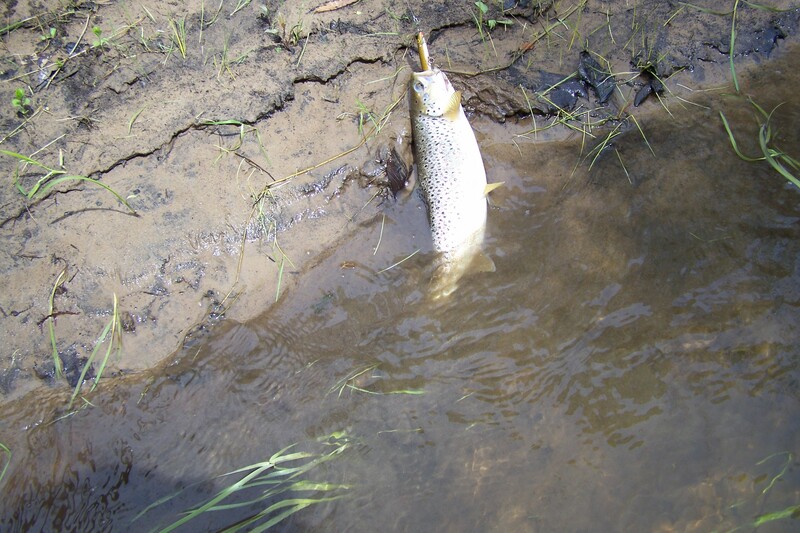 Right off the bat Feral hooked into a nice fish, a brown trout about 17 inches. He kept that and I took the lead. Another ten minutes I had a nice brown hit my lure but it didn’t stay on. I cast back to the same spot and she came up again. She was hungry. A couple more casts and she grabbed the small minnow lute and we had two fish. Feral wanted them both so we had two on the stringer. The stream was more interesting than we remembered. 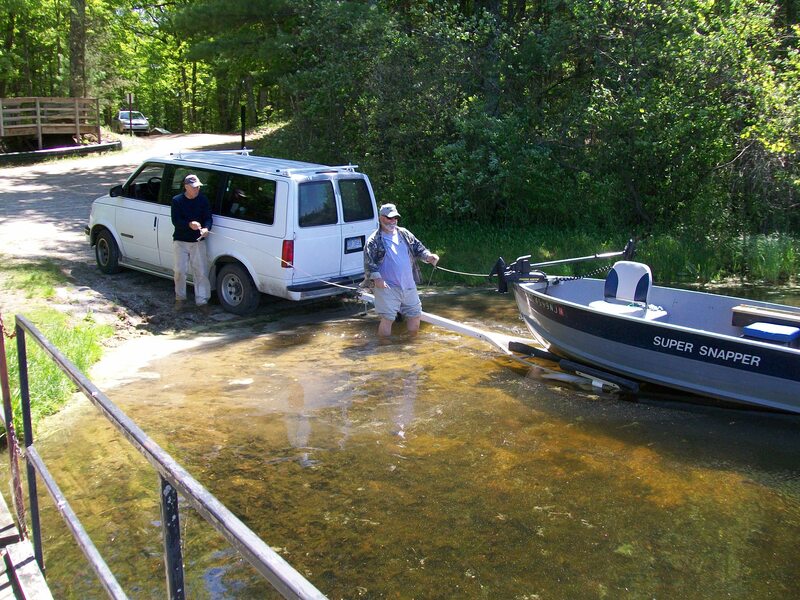 We used to fish this stretch when we were very young. Our Grandpa would spot us along the river which has a couple parking spots along a high ridge. You can’t get lost and the river is generally shallow so it’s a great place to introduce young kids to wading and spin fishing. 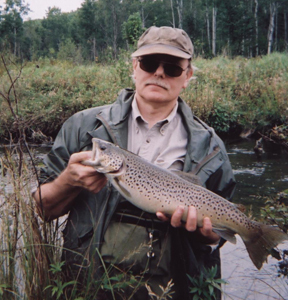 I couldn’t help but think of him when we caught the two trout – thinking just how much we owe him for teaching us not only trout fishing but for sharing his appreciation of the outdoors. We had a campfire, a guitar and a 4-string banjo and ripped off a couple old Johnny Horton songs then got creative on some Neil Young songs. Feral finds some interesting lead parts flat picking the banjo and I was willing to sacrifice my vocal chords to hit the melodies so that was a good way to close out a tough but fun day on the water.